Keith’s house is at 781 Blythe Road, the venue is the big red barn approx. 800m south/west of the house driveway. 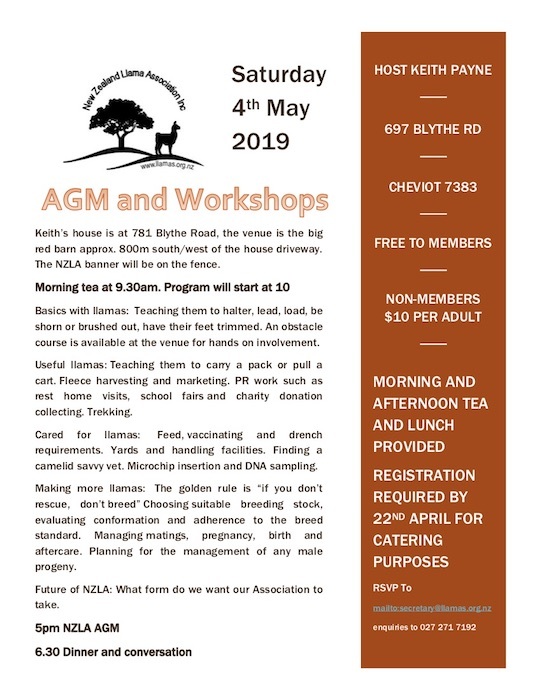 The NZLA banner will be on the fence. Teaching them to halter, lead, load, be shorn or brushed out, have their feet trimmed. An obstacle course is available at the venue for hands-on involvement. Teaching them to carry a pack or pull a cart. Fleece harvesting and marketing. PR work such as rest home visits, school fairs and charity donation collecting. Trekking. Feed, vaccinating and drench requirements. Yards and handling facilities. Finding a camelid savvy vet. Microchip insertion and DNA sampling. The golden rule is “if you don’t rescue, don’t breed” Choosing suitable breeding stock, evaluating conformation and adherence to the breed standard. Managing matings, pregnancy, birth and aftercare. Planning for the management of any male progeny. What form do we want our Association to take.